The History: Grigory Yefimovich Novykh lived for about 46 years beginning in 1869. Of humble origins, at 18 he joined a heretical group, Khlysty (Flagellants). His grasp of psychology gained him a reputation that including the seeming ability to heal Czar Nicholas's son Alexandra of hemophilia. In December, 1916 Prince Feliks poisoned Rasputin, then shot him and dumped his body in the river Neva. The Bolshevik's took over, exhumed his body and burned it. So much for the real story . . . this is theatre. 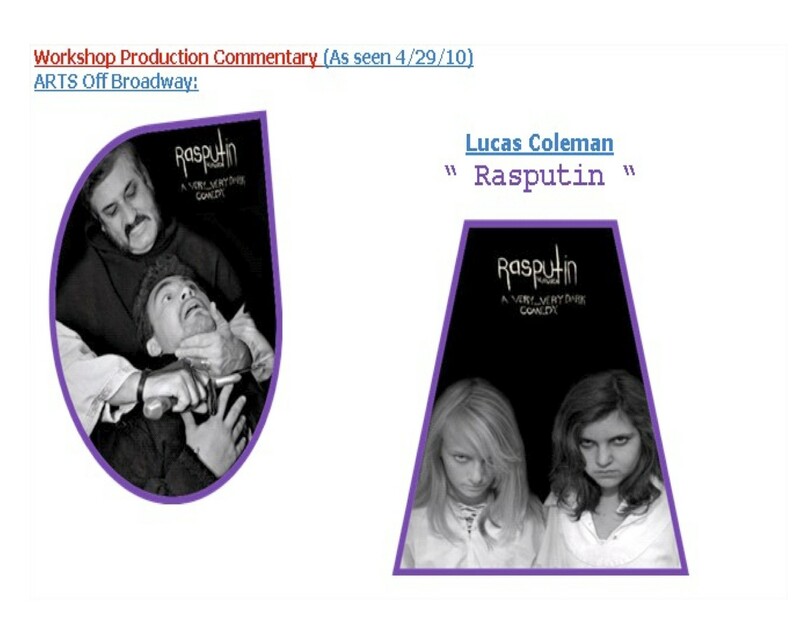 Lucas Coleman wrote the play as well as directed Rasputin The Musical, the current offering at the small stage at the Lyceum Theatre in Horton Plaza. Marc Wasserman wrote the music. Both collaborated on the lyrics. Their efforts sort of acknowledged the history of one Mr. Rasputin. North County's Arts Off Broadway is the producer. The small orchestra under Wasserman's baton opens with a full overture. The stage is bare except for a very large coffin down stage center. It is Rasputin's coffin that a crowd of people are standing behind singing "Funeral Chant." The cast, especially John Kelly, as Beeboe the teller of this tale about Rasputin, sings up close and at times quite personal to an audience member. We become immediately involved, almost a part of the story. Director Coleman has his cast of 20 constantly reacting to the events as they transpire. The basic staging is quite simple. The coffin, which is on wheels, is moved down stage and up stage by a group of peasants depending on its importance to the scene. As Beeboe begins each element of his story, the featured characters appear and an element of Rasputin's life is revealed. A peasant woman's right hand twitches throughout the play, yet I don't remember hearing her speak. Beeboe begins his tale with Rasputin's father determining the fate of his three children (two daughters and Rasputin). Andy Villarreal, who has an excellent singing voice, plays the young Rasputin. It may have been just this reviewer, but, at times, it appeared that the when the coffin and members of the cast were in the darkened background, a tableau looked striking similar to the Apostles in the Last Supper. Were they, in fact, pronouncing judgment on the scene before them? To get a feel for the show one only has to see some of song titles. Here are a few: "Welcome To Russia," "We've All Got Problems," "Evil Like Me," "Beelzebub in a Bottle," and "Take Back Your Soul." And that was just in the first act. The second act had a few reprises from Act One as well as "Murder Is Easy" and "Are You Feelin' Lucky?" Often the music was quite poetic. A few times the music seemed to be laughing at the whole show, a parody within a parody. If one listens intently to the music one finds signatures from other musicals. Fittingly, the last number was Tchaikovsky's 1812 Overture. The lighting was quite dramatic and added to the show. The costume department did an outstanding job costuming the huge cast with a wide variety of costumes. A look at the cast list revels that, in some instances, this is very much a family organization. 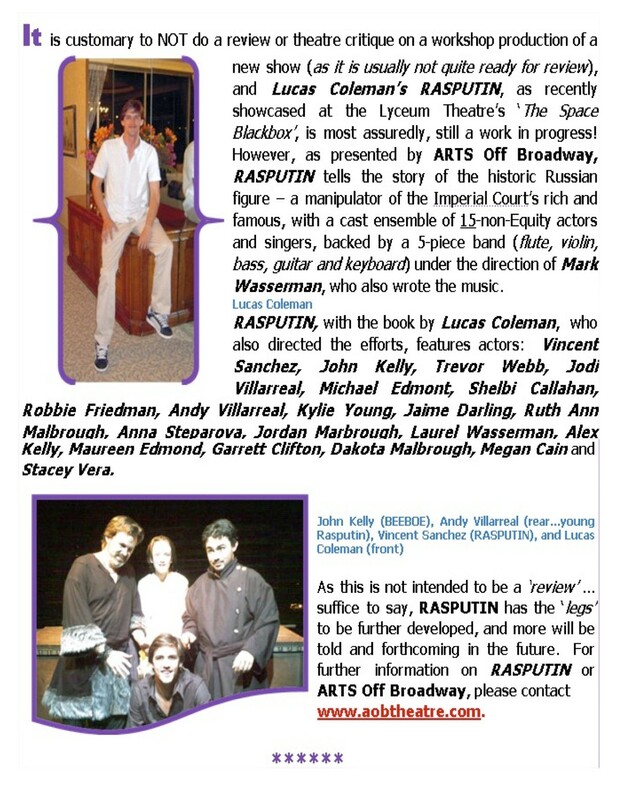 Arts Off Broadway has given San Diegans a special treat with Rasputin The Musical. It is fun, keeps the audience laughing, and has some very playful music. My only problem was that, at times, the orchestra overpowered the singers. This seemed to be a function of the radio microphone settings. I only wish their run was longer. Our hope is that it will be produced again so that more people can enjoy the show. Arts Off Broadway may be better known for its children‘s theater productions, but it will return to the adult genre once again this weekend with a three-day run of "Kiss Me Kate." Artistic Director Marie Verger has been producing children's theater productions for nine years but she yearned to branch out into more grown-up fare, so in June she produced her first community theater adult cast show, "Little Shop of Horrors," which was a big success. Her goal now is to produce six to eight shows each year, half of them with youth casts and half of them with adults. This weekend's production will actually be a double-bill. Patrons who show up an hour before each performance can see a shortened version of "Sleeping Beauty" starring 110 youth actors, followed by an adult-cast production of "Kiss Me Kate" starring a teen/adult cast of 31 with a live orchestra. Verger said she‘s always loved "Kiss Me Kate" but had never had the opportunity to produce it before with her youth company. "I've wanted to do it for a long time," she said. "It's a great dance show, a funny show and I love the costumes. Ticket sales are pretty good, we have over half the house sold for every performance so we're excited about it." First produced in 1948, "Kiss Me Kate" was revived on Broadway in 1999 and won five 2000 Tony Awards, including a best actor trophy for San Diego-bred Brian Stokes Mitchell. With a book by Sam and Bella Spewak and an 18-song score by Cole Porter, "Kiss Me Kate" is a play-within-a-play about a problem-plagued musical production of Shakespeare‘s "Taming of the Shrew" in 1948 Baltimore. Starring in the lead roles of Kate and Petruchio are temperamental actress Lilli Vanessi and vain actor/producer Fred Graham, who divorced a year earlier but have continued to perform together, though their volatile backstage fights often expand into their onstage performances. Meanwhile, a romance between two other actors, Bill Calhoun and Lois Lane (who play the Shakespearean lovers Lucentio and Bianca in the "Shrew" musical), is on the skids because of Bill‘s gambling problem, which leads two mafia bullies to show up at the theater to collect the debt. When Lilli threatens to quit the show, Fred enlists the goons to don costumes and keep her prisoner on the set. 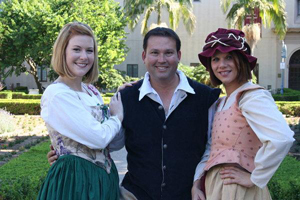 The Arts Off Broadway production of "Kiss Me Kate" will be directed by Jonathan Zierden, who has been performing in theaters around San Diego County for more than 15 years (starting out as a 13-year-old in "West Side Story"). Zierden directed Arts Off Broadway‘s "Little Shop of Horrors" in June and he has directed productions for Broadway Bound Youth Theatre and Broadway Theatre Arts Academy. Verger said that many of the actors in "Kiss Me Kate" are the parents of children from her youth company who‘ve been bitten by the acting bug. "I had about 10 parents drop their kids off for ‘Sleeping Beauty’ and then stay for ‘Kiss Me Kate’ auditions," Verger said. "It‘s great that they want to perform. The only downside is that when I‘ve been asking for volunteers to help with ‘Sleeping Beauty,’ a lot of my parents are now too busy performing in ‘Kiss Me Kate.’ "